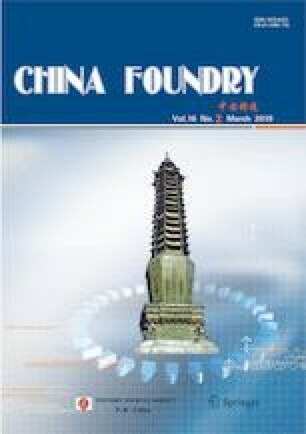 The mold filling process of titanium alloy in a thin-walled cylinder cavity under vertical centrifugal casting process was studied by means of the hydraulic simulation experiments. Results show that the filling mode of the melt in the cylinder cavity varies with casting wall-thickness. When the casting wall-thickness is less than or equal to the thickness of the first layer during the filling process, the melts fill the cavity from the bottom to the top. When the casting wall-thickness is greater than the thickness of the first layer during the filling process, the melts first fill the largest radius parts of the cavity with a certain thickness of the first layer from the bottom to the top of the cavity, and then they fill the cavity from the larger radius part to the smaller radius part. The melt filling ability increases with the increment of the mold rotational speed and the pouring temperature. In another aspect, the melt filling ability rises with the decrement of the melt viscosity, and the melt with the better filling ability is prone to fill the cylinder cavity layer by layer. Shi-ping Wu Male, Ph.D., Professor. Research interests: theory and technology of materials solidification and structure control; numerical simulation of mold filling and solidification. This work was financially supported by the National Natural Science Foundation of China (Grant No.51475120) and the Project of Science and Technology of Henan Province of China (2018QNJH25, 182102110096).